Ray Galton and Alan Simpson’s writing career started in the late 1940’s (when they were both confined in the same tuberculous sanatorium) and it continued for the next thirty years – coming to an end with this series. After The Galton and Simpson Playhouse was transmitted in 1977, Alan Simpson retired from scriptwriting whilst Ray Galton carried on, working with several other collaborators (such as Johnny Speight). Galton and Simpson, are of course, best known for Hancock’s Half Hour (six radio series and six television series), Hancock (their seventh and final television series written for Tony Hancock, featuring classics such as The Bedsitter, The Lift, The Bowmans, The Blood Donor and The Radio Ham) and Steptoe and Son. Following Tony Hancock’s decision to fire them as his writing team, the BBC offered them carte-blanche to write about anything they wished, and so the Comedy Playhouse series was born. One episode, The Offer concerned two rag and bone men and it seemed to have potential – out of this came the long-running Steptoe and Son. YTV’s The Galton and Simpson Playhouse seemed to be a conscious nod to this series, as the programme clearly emulated the style of Comedy Playhouse (one off comedy playlets featuring some of the best acting talent around). It’s a pretty decent effort for them to bow out on, as whilst it’s fair to say that their writing heyday was in the 1950’s and 1960’s, this series isn’t completely without merit. Having said that, it’s a shame that it kicked off with Car Along The Pass, easily the weakest of the seven shows. Henry and Ethel Duckworth (Arthur Lowe and Mona Washbourne) take a cable-car trip in the Swiss Alps. Henry hasn’t enjoyed his holiday at all and things don’t improve when the cable-car stops when it’s only half way across. The passengers are told that repairs will take a few hours, so naturally Henry (since he’s an Englishman) decides to take charge. Henry Duckworth has faint echoes of Lowe’s most famous comedy character (Captain Mainwaring from Dad’s Army). 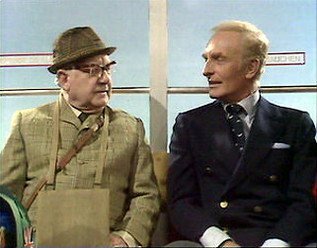 Both are rather pompous and incredibly proud of their country of birth, but Mainwaring is also a basically decent man (plus he has the rest of the platoon to keep him in check). Duckworth is just a blinkered bore, with no redeeming qualities whatsoever. There’s plenty of comic potential in taking a disparate group of people and trapping them in a confined space – after all, Galton and Simpson did this to great comic effect with the Hancock episode, The Lift. But Car Along The Pass is a very pale imitation. Had Henry learnt anything about his fellow passengers, or himself, then it might have been worthwhile – but his worldview remains the same at the end as it was at the start. He’s dismayed to find there’s only a few British people aboard and even more upset to discover that means he’s surrounded by foreigners. The one that seems to cause him the most pain is a smooth-talking German, Heinz Steiner (Anton Differing). Steiner is something of an anglophile and professes a love of rugby (which he played whilst at public school in England). When Steiner asks if Duckworth attended public school, the Englishman is reticent. “That, um, is something that we never ask in England. We just know.” Predictably, Ethel spoils the moment by saying she didn’t think Henry played rugby at Witham Grammar, she though he played football instead. Steiner wonders if Henry has visited Germany. Yes, he says, in 1945. The presence of French and Italians gives him further scope to restate the superiority of the English. During this, it’s hard to decide whether we should be laughing at him or with him. It’s the Alf Garnett problem, I suppose – some of the audience will probably agree with his sentiments whilst others will view him as an out-of-date dinosaur. My affection for Arthur Lowe means that I can find some merit in this (although you have to dig deep) and Anton Differing is very good, but to be honest, Car Along The Pass is pretty poor stuff.